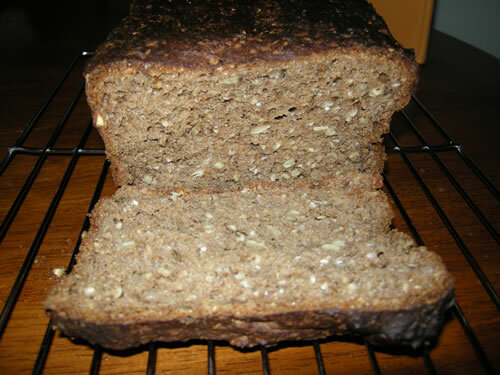 Healthy and Gluten Free: Gluten Free Wholegrain Bread! It's not easy on a gluten free diet to find bread that even remotely resembles wholegrain. My days of eating that dark german bread I so loved are over..but recently I made a discovery: Bobs Redmill Hearty Whole Grain Bread Mix. This mix makes a large and substantial loaf and which is the probably the closest thing to that german rye bread you'll find, and even looks like it. It's a great sandwich bread and goes very well with cheeses and savoury spreads. It actually tastes very much like a wheat bread and so could almost fool wheat eaters! As with most gluten free breads it is best kept in the fridge and eaten within a few days, or you can freeze slices and take out as needed. The ingredients list is 23 items long, with everything from cocoa powder to onion powder. It must have taken a while to develop this recipe and it's really not an easy task! Pros: Great sandwich bread, tastes almost as good as german rye bread, good sized loaf. It's more nutritious than most gluten free breads. Cons: It's not organic, contains sugar (9th on ingredient list), potato flour and may contain traces of tree nuts.